تحسين مستوى الصوت على الانترنت والراديو، ومقاطع الفيديو والاغاني والالعاب على الكمبيوتر. سوف يساعدك برنامج مضخم مستوى الصوت على الكمبيوتر DFX Audio Enhancer على التحكم بمستوى اداء وجودة الصوت بسهولة من خلال التحكم بمؤشر الصوت. يعد برنامج رفع تضخيم الصوت في الكمبيوتر وسيلة فعالة وقوية لرفع مستوى صوت الراديو، وملفات الموسيقى والاغاني، اضافة الى اي صوت من مواقع الانترنت. خصائص جودة الصوت في الكمبيوتر تعتمد على المكونات البرمجية اضافة الى الهاردوير، حيث يساعدك هذا البرنامج على تكافئ اداء الاصوات على الكمبيوتر مع باقي المكونات الاخرى. Sound is definitely a big part of our life. Depending on its nature, strength or musicality, sound can be perceived differently as pleasant or totally unwelcome. This is the case of the sound that your computer emits, too. When it comes to accuracy, it doesn't take a specialist to understand what audio quality means – the moment you hear a high-fidelity song, you will enjoy every second of it. Listening to on-line radio, your personal music files or audio from any website has become one daily activity for most people that work with computers. Thus, making this experience one to please the ear is what audio enhancement software does or at least tries to accomplish. 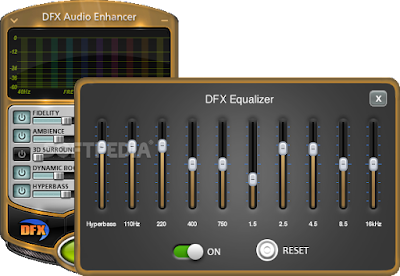 DFX Audio Enhancer is a member of this category and one of the top choices in most cases. Audio quality has two main aspects when analyzed on PCs – hardware and software. Poor sound may be the result of low hardware performance or reduced audio stream bitrate that narrows the frequencies and even eliminates many of them. Software driven solutions are available though and they brag on performing miracles in order to provide increased sound quality even in worst case scenarios.